this is where i discuss writing and publishing “Midnight”, my first novel. The party happened June 8, 2014, at The Morris Book Shop in Chevy Chase here in Lexington. 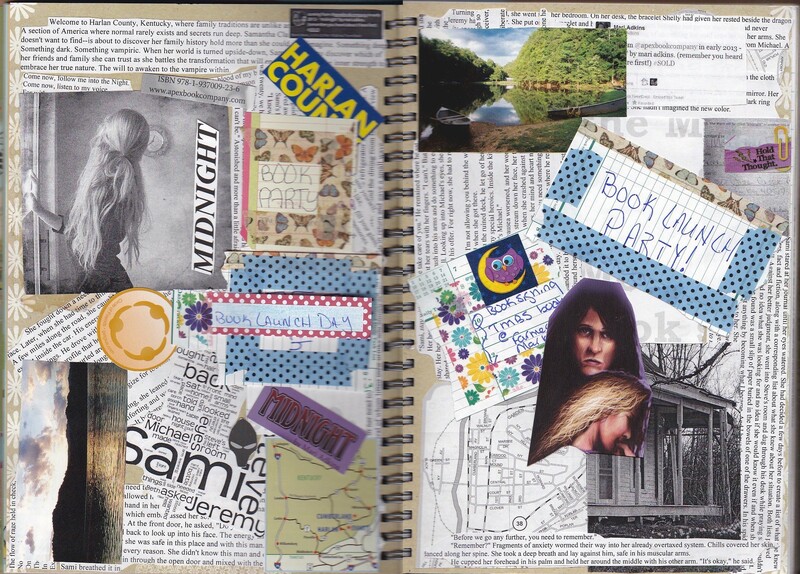 I created this spread in my smashbook just a few minutes ago. I’m a guest blog at Jodi Lee’s Into the Mirror. Buy Midnight and Harlan County Horrors for one low price! Midnight by Mari Adkins has officially been released and to celebrate we’re running a deal to make sure readers get their fill of the horrors that haunt Harlan County, Kentucky. Buy Midnight and Harlan County Horrors, Apex’s regional horror anthology that Mari edited, together for one low price. Snag print copies of both books for only $20, plus free domestic shipping! Prefer the paperless feel of eBooks? The eBook editions can be bought together for a mere $8.99. The sale runs from May 13th till May 20th. To take advantage of this fantastic deal head over to the Midnight product page. Order links for the sale are below the cover image. Be sure to drop by and check it out! It’s a character sketch of Samantha Clark. Even after five years, it seems like some people are still confused by my vampires. So, I think it’s high time for a(nother) explanatory blog post. (See also, my bibliography page) For the record, the questions here pertain to Midnight. What is the core of this story? Who is the antagonist in this story? What does Sami have to lose? What does Sami have to learn? The core of this story is Sami losing herself only to find herself and where she belongs. Learn, laugh, live – and remember that Darkness Doesn’t Have To Mean Evil. Samantha Clark is her own antagonist. I know a lot of readers expect for some villain to rise out of the shadows. In this story, that isn’t necessary. As cliché as it is, Sami is her own worst enemy. She’s been abused and told she is neither wanted nor loved over the course of her lifetime. She comes into the story lost, depressed, and with little will and no direction. She believes her ultimate goal is to regain the life she had made for herself and had had ripped away from her in Richmond. If she can get back to Richmond, she can rebuild what she’s lost.Over the course of the story, Sami falls further into the darkness and comes close to losing sight of everything she ever was and ever had. She drowns herself in alcohol and marijuana to hide from the pain that awaits her in reality. That rope with the knot in it that she clung so tightly to? she feels she slipped off of the rope and lost sight of the knot months before, if not a year before, she ever came to Harlan County. How to get it back within sight and reach, she doesn’t know. Sami has to learn that some things she thought were real aren’t and some things she thought weren’t real are. She had to learn that she does have a home, that she does belong, and that there are people in the world who do love her. Within the darkness, she must find herself and the source of her own personal power. Also there, she must come to terms with the life she ran away from and face her new beginnings. I like how “human” your vampires are. But I’d lik them to seem more dangerous. Where’s the danger in these vampires? Where’s their rage and conflict? These questions make me scream, “You’re missing the point! at the top of my lungs until my voice cracks. But, like Sami, most people expect classical, Bram Stoker-like vampires. Mine just aren’t like that. And no matter how much people complain, my vampires never will be like that, either.Being human with human issues is the point. As I’ve stated before, my stories are more about ‘humans having a vampire problem’ than anything else. My point from the onset of the idea of Midnight was that my vampires had to be as human as possible. In my Harlan County, more danger lies in not awakening to the vampire within than lies in the actual becoming. In those who aren’t given the change to ‘become’, awakening may manifest in actual physical or psychological illness or even debilitation untraceable by the best of medical professionals to any one specific source. These people become empty due to their ‘illness’ without knowing or understanding as to how to fill those voids. Their bodies rebel, then, shutting down vital functions seemingly at random, filling the hollows with cancer, depression, or other maladies. These people sometimes turn to self-harm or even suicide. As for their ‘power’, it isn’t the same as the run-of-the-mill, overused supernatural tropes. This is in part where the ‘paranormal‘ – not the same as supernatural – comes in.My vampires have their metaphysical skills tested during the earliest stages of their awakening. If they’re found not to be adept, not to have any Pagan leanings or magical skills, they are introduced to someone outside of the Anethdraeg (House of the Dragon) clan who will help them – unless they are found by the others first. If they’re found to be adept, then they are given some training, helped through the awakening process, and are adopted into the Family. Their power comes from their own metaphysical prowess, from what lies within their own chemistry, through their relationship(s) with their god(s), and from genetics. Some have more, some have less. Except for the Elder. He has his own basket of idiosyncrasies. As a whole Family, this balances out when they all have need to work together. What rage and conflict they do have, if any, is what they bring with them over the process of being turned and through the course of the change. Anything they’re hard-convinced of, any vices they have, any deeply-held beliefs, they bring those with them into their ‘vampirehood’ (ha! I just made up that word!). And there’s what Stephen Young calls the ‘infamous vampire guilt’. Many vampires spend too much time wallowing in the regret of things they’ve done or left undone. Both Steve and his friend Michael Devon are infamous for their ‘brooding’. As for the rage? Well, some have that, but it more boils down to ‘genetic temper’ than vampireness. Where are the compact discs, the Internet, and cellular telephones? Why can’t Michael call a cab for those who are too inebriated to drive after a party? These questions make me laugh until I ache. On the very first page of the story, it says in clear letters and language: 1985 – September. Ergo people:CDs arrived in 1982, yes, but in the Kentucky mountains in 1985, we were still fairly clueless about CDs; we still had our LPs and .45rpms, didn’t have the hundreds of dollars required for a CD player, and were convinced vinyl would live for eternity. Cell phones. The first 1G (yes, 1G, we’ve come that far!) network in America came online in Chicago in 1983, and cell phones were gigantic and weighed ten pounds. I’m not certain when cell phones made it to Kentucky, but I bought my first cordless telephone in 1989 – they’ve been around since 1968 but became popular / more common in the mid to late 80s. The Internet. ARPANET came around in 1962. E-mail was born the same year as I was. Public access to either wouldn’t come until much later. While I took programming languages classes all through high school, I didn’t really know what a ‘net was until 1987 in college when I had my introduction to the VAX. Back then, it took webmail ten to fifteen minutes to go from my terminal to the one beside me; so while we waited, we would talk or do actual homework! We had our EKU-BBS, but even that took time. NSF released its sponsorship of the Internet in May 1995, four years after Al Gore ‘created’ the Internet. This brings us to Michael calling a cab.I’ve also been asked about passenger rail service. First of all, passenger rail service died in Kentucky in the early 1960s – and it’s not the kind of rail service you’re probably thinking of, anyway. If we want to ride Amtrak, we have to go to Cincinnati, Louisville, Maysville – or gods forbid, Atlanta, Charlotte, or St Louis. So trains are straight out. The trains we’ve had in Kentucky for over forty years now are of the freight and coal variety. And there is no such thing as ‘light rail’ here. When I first saw the question about Michael calling a cab, I stared at it a few minutes, then I laughed. Out loud. You might even say I guffawed. Because only people who live in major metropolitan areas and / or who don’t understand how back of beyond rural eastern Kentucky is ask questions like this. Is it possible to start the story with Sami meeting Michael at the party? Absolutely not. That’s one thing I refuse to change. The story starts with Sami crashing into Loyall after a panicked three hour drive which started with her running away from her abusive boyfriend. This gives the reader Sami’s mind state along with other information that would be lost or too ridiculous to put in as asides or memories. I won’t cheapen my story or lessen Sami’s pain and experiences this way. Why can’t there be more interaction between Michael, Steve, and Jeremy? First of all, the story is set completely within Sami’s point of view. It’s called ‘limited narrator’. The reader perceives the story through Sami, and she’s unable to tell the reader anything she doesn’t know outside her own experience. If those three men have contact with each other and Sami isn’t there, then it’s impossible for her to relay those meetings to the reader – especially when she doesn’t have a clue they exist. The concept is very simple, and I have trouble grasping why it’s difficult for some readers to understand. I learned how to use this in seventh grade Language Arts class. If the narrator doesn’t know, the reader doesn’t know. “Limited omniscient allows the narrator to relate the thoughts and feelings of only one character”. * If Sami isn’t in the same room with Michael, Steve, or Jeremy, then she doesn’t know what they’re doing or what’s being said – or even if or when all three are together or not together. Therefore, it’s inconceivable that she could communicate that information to the reader. Why is Shelly in the book? Jeremy Bradford can’t spend all of his time at school, in band practice, or with Michael, can he? When he isn’t in scene with Sami, he doesn’t always run home to his mother or to The Market to Steve. Shelly is important to Jeremy, which is why he introduces Sami to her. The reader doesn’t see Shelly in the sequel, but she is mentioned and plays a critical part to Jeremy’s future. Between Midnight and the sequel, Shelly and Sami develop a strong, sisterly friendship. The better question to ask might be, “Why is Angela in the story?” No, really. Why is Angela in the story? We meet her on the first page, and her name is mentioned in the narrative a whopping nineteen times. The reader never sees her outside of The Market – except that first night when she brings Sami’s car to Steve’s. Shelly’s name is mentioned fifty-five times, and Sami has quite a bit of interaction with her as they build their friendship. Shelly is important to the story. Angela is just a clerk in a corner convenience store. Someone has to mind the place when Steve can’t be there, right? I think that wraps up this session. If anyone has any questions, please post them in the comments. I’ll compile them and create another post later. * Basic English Revisited: A Student Handbook, 1985. 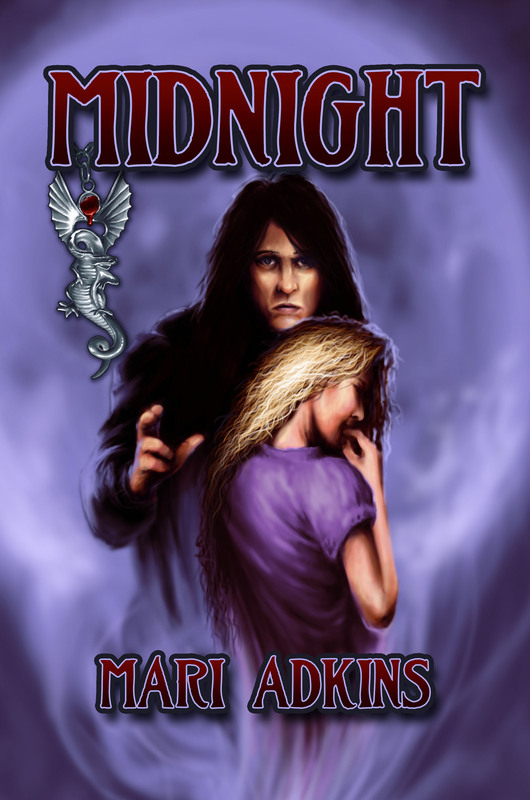 This is the cover for our upcoming novel MIDNIGHT by Mari Adkins. The artwork and design was created by Billy Tackett. The book is due to be published May 27th. A romantic supernatural fantasy, Mari Adkins’s Midnight introduces us to Sami as she first enters Harlan County, Kentucky and begins a journey that will change her life. Samantha Clark has always known she was different. Brought up in a loveless household, she can almost forgive herself for turning to an abusive boyfriend to help give her the roots and love she desperately needs. But that solution turns violent, and Sami is on the run, turning to a college friend who offers her a new hope at ‘family’. Set in Harlan, Kentucky in 1985, Midnight is the inward journey of Sami’s self-loathing, self-reflection, and eventual self-acceptance. Through the love of her friends and the mysterious Michael, Sami not only heals from the scars given earlier in life, she finds her personal strength.